Meet the 2017 Chile Lindo Pavilion. 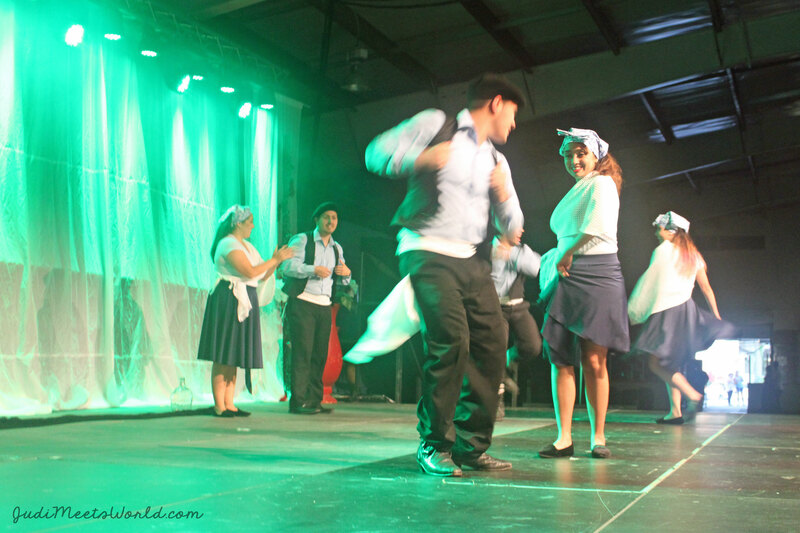 My Chilean experience is one that is filled with helpful and friendly volunteers at the venue and eager performers on stage. Read on to hear about my adventure at the Chile Lindo Pavilion! One of the things I first think of when I think of Chile has become the Rapa Nui statues. Rapa Nui is the native name for Easter Island, with those famous, huge stone statues buried neck-deep. They also have samples of Chilean performance costumes and instruments. Their souvenir shop has great little mementos as well as beautifully hand-woven bags and knitted sweaters for. Stock up on some empanadas and try the pastel de choclo which is a corn pie. Wash this down with a glass of borgona – a rich red wine with strawberries! For dessert, try their torte called Torta Mil Hojas, or thousand-layer cake. Yum! Their entertainment depicts the daily lives of those in Chile. 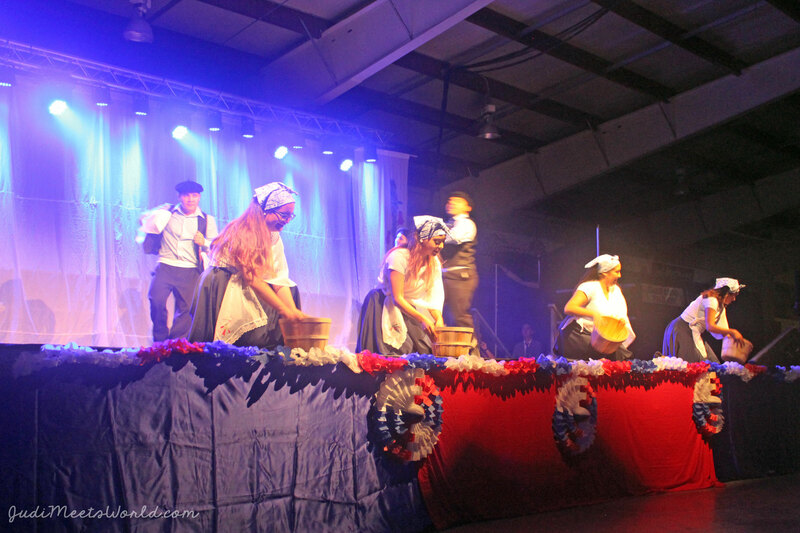 They also feature Chilean festivals and celebrations, as seen in their finale number. The two MCs explain which region we are visiting and the significance of the costumes and performances. We were able to see pieces from the south, central and northern regions of Chile – talk about a whole country tour! You can hear the distinct sound of the brass section in their music which takes a predominant role in their dance numbers. The night ended with a very high-energy number with a little modern twist in it! Why yes, that was Despacito you heard with a Chilean band interpretation. They also perform different sets each show, so if you choose to stay for the next one, it’s a whole different experience. Such a party! DJ David Gomez is involved in this pavilion to host and play for the Friday & Saturday parties. I hope you had your chance to party at the Chilean pavilion! A special thank you, also, to their media chair who made us feel welcomed and answered our questions! Thank you again to the folks at the Chile Lindo Pavilion! We hope you had a wonderful week! Meet the 2017 Casa do Minho Portuguese Pavilion. Meet the 2017 Africa Pavilion.